W Edwards Deming was very impressed with Japanese railways. In Out of the Crisis (1986) he wrote this. 1725 h Leave Taku City. Only one minute to change trains? You don’t need a whole minute. You will have 30 seconds left over. No alternate plan was necessary. My friend Bob King … while in Japan in November 1983 received these instructions to reach by train a company that he was to visit. 0903 h Board the train. Pay no attention to trains at 0858, 0901. No further instruction was needed. Deming seemed to assume that these outcomes were delivered by a capable and, moreover, stable system. That may well have been the case in 1983. However, by 2005 matters had drifted. 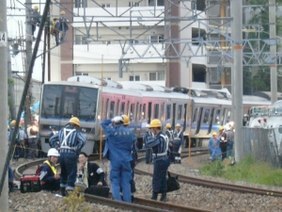 The other night I watched, recorded from the BBC, the documentary Brakeless: Why Trains Crash about the Amagasaki rail crash on 25 April 2005. I fear that it is no longer available in BBC iPlayer. However, most of the documentaries in this BBC Storyville strand are independently produced and usually have some limited theatrical release or are available elsewhere. I now see that the documentary is available here on Dailymotion. The documentary painted a system of “discipline” on the railway where drivers were held directly responsible for outcomes, overridingly punctuality. This was not a documentary aimed at engineers but the first thing missing for me was any risk assessment of the way the railway was run. Perhaps it was there but it is difficult to see what thought process would lead to a failure to mitigate the risks of production pressures. However, beyond that, for me the documentary raised some important issues of process discipline. We must be very careful when we make anyone working within a process responsible for its outputs. That sounds a strange thing to say but Paul Jennings at Rolls-Royce always used to remind me You can’t work on outcomes. The difficulty that the Amagasaki train drivers had was that the railway was inherently subject to sources of variation over which the drivers had no control. In the face of those sources of variation, they were pressured to maintain the discipline of a punctual timetable. They way they did that was to transgress other dimensions of process discipline, in the Amagasaki case, speed limits. Anybody at work must diligently follow the process given to them. But if that process does not deliver the intended outcome then that is the responsibility of the manager who owns the process, not the worker. When a worker, with the best of intentions, seeks independently to modify the process, they are in a poor position, constrained as they are by their own bounded rationality. They will inevitably by trapped by System 1 thinking. Of course, it is great when workers can get involved with the manager’s efforts to align the voice of the process with the voice of the customer. However, the experimentation stops when they start operating the process live. Fundamentally, it is a moral certainty that purblind pursuit of a target will lead to over-adjustment by the worker, what Deming called “tampering”. That in turn leads to increased costs, aggravated risk and vitiated consumer satisfaction. This old chestnut refuses to die and I see that it has turned up again on the BBC website. I have been intending for a while to blog about this so this has given me the excuse. I think that there has been a terrible history of misunderstanding this problem and I want to set down how the confusion comes about. People have mistaken a problem in psychology for a problem in probability. Here is the classic statement of the problem that appeared in Parade magazine in 1990. The rational way of approaching this problem is through Bayes’ theorem. Bayes’ theorem tells us how to update our views as to the probability of events when we have some new information. In this problem I have never seen anyone start from a position other than that, before any doors are opened, no door is more probably hiding the car than the others. I think it is uncontroversial to say that for each door the probability of its hiding the car is 1/3. Once the host opens door No. 3, we have some more information. We certainly know that the car is not behind door No. 3 but does the host tell us anything else? Bayes’ theorem tells us how to ask the right question. The theorem can be illustrated like this. The probability of observing the new data, if the theory is correct (the green box), is called the likelihood and plays a very important role in statistics. Without giving the details of the mathematics, Bayes’ theorem leads us to analyse the problem in this way. We can work this out arithmetically but, because all three doors were initially equally probable, the matter comes down to deciding which of the two likelihoods is greater. So what are the respective probabilities of the host behaving in the way he did? Unfortunately, this is where we run into problems because the answer depends on the tactic that the host was adopting. And we are not given that in the question. Consider some of the following possible tactics the host may have adopted. Open an unopened door hiding a goat, if both unopened doors have goats, choose at random. If the contestant chooses door 1 (or 2, or 3), always open 3 (or 1, or 2) whether or not it contains a goat. Open either unopened door at random but only if contestant has chosen box with prize otherwise don’t open a box (the devious strategy, suggested to me by a former girlfriend as the obviously correct answer). Choose an unopened door at random. If it hides a goat open it. Otherwise do not open a door (not the same as tactic 1). There are many more. All these various tactics lead to different likelihoods. So if we were given this situation in real life we would have to work out which tactic the host was adopting. The problem is presented as though it is a straightforward maths problem but it critically hinges on a problem in psychology. What can we infer from the host’s choice? What is he up to? I think that this leads to people’s discomfort and difficulty. I am aware that even people who start out assuming Tactic 1 struggle but I suspect that somewhere in the back of their minds they cannot rid themselves of the other possibilities. The seeds of doubt have been sown in the way the problem is set. A participant in the game show would probably have to make a snap judgment about the meaning of the new data. This is the sort of thinking that Daniel Kahneman calls System 1 thinking. It is intuitive, heuristic and terribly bad at coping with novel situations. Fear of the devious strategy may well prevail. A more ambitious contestant may try to embark on more reflective analytical System 2 thinking about the likely tactic. That would be quite an achievement under pressure. However, anyone with the inclination may have been able to prepare himself with some pre-show analysis. There may be a record of past shows from which the host’s common tactics can be inferred. The production company’s reputation in similar shows may be known. The host may be displaying signs of discomfort or emotional stress, the “tells” relied on by poker players. There is a lot of data potentially out there. However, that only leads us to another level of statistical, and psychological, inference about the host’s strategy, an inference that itself relies on its own uncertain likelihoods and prior probabilities. And that then leads to the level of behaviour and cognitive psychology and the uncertainties in the fundamental science of human nature. It seems as though, as philosopher Richard Jeffrey put it, “It’s probabilities all the way down”. Behind all this, it is always useful advice that, having once taken a decision, it should only be revised if there is some genuinely new data that was surprising given our initial thinking. … we habitually and, it seems, unthinkingly assume that the problem facing … a business man, is of the same kind as those set in examinations in mathematics, where the candidate unhesitatingly (and justly) takes it for granted that he has been given enough information to construe a satisfactory solution. Where, in real life, are we justified in assuming that we possess ‘enough’ information? News media have been full of the tale of London’s Walkie-Talkie office block raising temperatures on the nearby highway to car melting levels. The full story of how the architects and engineers created the problem has yet to be told. It is certainly the case that similar phenomena have been reported elsewhere. According to one news report, the Walkie-Talkie’s architect had worked on a Las Vegas hotel that caused similar problems back in September 2010. More generally, an external hazard from a product’s optical properties is certainly something that has been noted in the past. It appears from this web page that domestic low-emissivity (low-E) glass was suspected of setting fire to adjacent buildings as long ago as 2007. I have not yet managed to find the Consumer Product Safety Commission report into low-E glass but I now know all about the hazards of snow globes. The Walkie-Talkie phenomenon marks a signal failure in risk management and it will cost somebody to fix it. It is not yet clear whether this was a miscalculation of a known hazard or whether the hazard was simply neglected from the start. Risk identification is the most fundamental part of risk management. If you have failed to identify a risk you are not in a position to control, mitigate or externalise it in advance. Risk identification is also the hardest part. In the case of the Walkie-Talkie, modern materials, construction methods and aesthetic tastes have conspired to create a phenomenon that was not, at least as an accidental feature, present in structures before this century. That means that risk identification is not a matter of running down a checklist of known hazards to see which apply. Novel and emergent risks are always the most difficult to identify, especially where they involve the impact of an artefact on its environment. This is a real, as Daniel Kahneman would put it, System 2 task. The standard checklist propels it back to the flawed System 1 level. As we know, even when we think we are applying a System 2 mindset, me may subconsciously be loafing in a subliminal System 1. It is very difficult to spot when something has been missed out of a risk assessment, even in familiar scenarios. In a famous 1978 study by Fischhoff, Slovic and others, they showed to college students fault trees analysing potential causes of a car’s failure to start (this is 1978). Some of the fault trees had been “pruned”. One branch, representing say “battery charge”, had been removed. The subjects were very poor at spotting that a major, and well known, source of failure had been omitted from the analysis. Where failure modes are unfamiliar, it is even more difficult to identify the lacuna. There is no finite checklist of rules or questions that an engineer can apply and answer in order to declare that a design is perfect and absolutely safe, for such finality is incompatible with the whole process, practice and achievement of engineering. Not only must engineers preface any state-of-the-art analysis with what has variously been called engineering thinking and engineering judgment, they must always supplement the results of their analysis with thoughtful and considered interpretations of the results. I think there are three principles that can help guard against an overly narrow vision. Firstly, involve as broad a selection of people as possible in hazard identification. Perhaps, diagonal slice the organisation. Do not put everybody in a room together where they can converge rapidly. This is probably a situation where some variant of the Delphi method can be justified. Secondly, be aware that all assessments are provisional. Make design assumptions explicit. Collect data at every stage, especially on your assumptions. Compare the data with what you predicted would happen. Respond to any surprises by protecting the customer and investigating. Even if you’ve not yet melted a Jaguar, if the glass is looking a little more reflective than you thought it would be, take immediate action. Do not wait until you are in the Evening Standard. There is a reputation management side to this too. Thirdly, as Petroski advocates, analysis of case studies and reflection on the lessons of history helps to develop broader horizons and develop a sense of humility. It seems nobody’s life is actually in danger from this “death ray” but the history of failures to identify risk leaves a more tangible record of mortality.